The Rat's recent liquidation of his holdings in rMachines Inc. left him and his family with a surplus of spending money [GCN, April 24, Page 50]. So the Rat turned to the Internet to blow off some of his morally ambiguous gains. Much to the whiskered one's chagrin, so did Mrs. Rat. The extent of his better half's redistribution of wealth became clear the morning a Postal Service alternative'you know, in the brown uniform'drove up outside the Rat burrow. Smelling an Internet buy, the cyberrodent dashed to the door. Surely the package in the courier's hand must be the prize from his latest victorious bid on WeRid.com'another one of those excess inventory auction sites. Imagine the Rat's disappointment when he chewed through the packing tape, getting his incisors all gummy, only to find that the delivery was a box of items for Mrs. Rat from Mega Online Drugplace. 'Oh, thanks for signing for me, dear.' She smiled as she plucked the box from his paws. Next thing the Rat knew, his wife got a handwritten thank-you note from Amazon.com's Jeff Bezos, and the ratlings had filled an entire room with air cells and bubble wrap. They were competing to see who could make the loudest pop while jumping. Meanwhile, the Rat had amassed enough corrugated cardboard to build a replica of the Andrea Doria. 'Maybe we should keep some money for a rainy day,' the Rat suggested to his better half over breakfast one morning. The Rat sighed and nodded submissively. The whiskered one shuddered at the thought of his increasingly distressed letter carrier delivering an oven in a standard-issue USPS Jeep. The Rat shuddered again, remembering what had happened when the department store delivered a refrigerator last year. It had taken him weeks to rebuild the foyer wall. By delivery day, the Rat discovered that the dot-com delivery process was exactly the same as for a department store. There were the same snarling werewolves in customer service at the warehouse and the same delivery mammals that had performed unauthorized remodeling on his refrigerator. 'Maybe if we get a running start, it'll fit,' one delivery critter said to the other as they tried to negotiate the doorframe of the Rat's kitchen. 'You could just take the door off the stove,' the Rat yelled just as the two lunged forward, splinters flying. 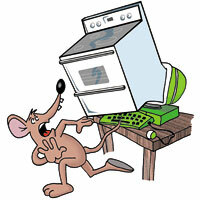 By the time the oven landed in the kitchen, the Rat had reviewed the shipping bill and installation instructions. 'We're missing the required attachment flange that was supposed to come with the stove,' he complained. 'Oh, you'll have to get that from the store where you bought it,' said the more weasellike delivery critter as he wiped his paws on the dining room drapes.